Nothing inspires me more than nature and fresh produce. When we see fruit bearing trees in season it is the most humbling experience. The way the branches bend down with the sheer weight of the fruits and the way these fruiting trees invite hoards of chirpy birds towards them, brings the truth to light that no matter what, you can always look up to nature and find your answers. That after every lull there is abundance of happiness. Last week we were on a week long vacation to Raju's cottage Goshaini (Teerthan Valley, Himachal Pradesh) during the fruiting season of most fruits they have in their orchard. 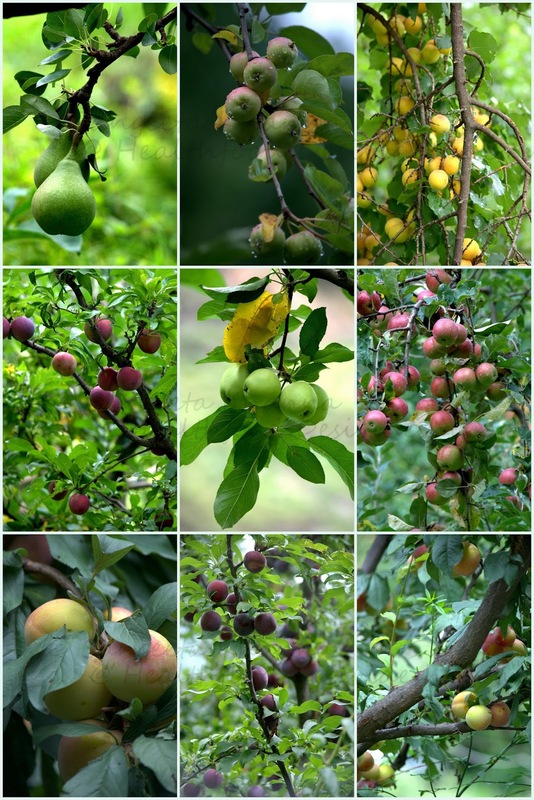 Peaches were dwindling down but plums blushed on the trees like plump round garnets and rubies, luscious Apricots were so abundant that the trees were shedding fruits by the kilos. Apples hung studded on the branches like someone had tied them up in tight bunches. Rajiv Bharti, the owner of the home stay and the orchard said the fruits were good this season and while Plums and Apricots had reached their prime by now and were already going to the local markets, Pears will be over soon but the apples will keep coming till late August as he has many varieties of apples that ripen one after the other. One good thing to know is that Rajiv never uses pesticides of chemical fertilizers in his orchards and yet he is not worried about reaching some organic market or distributor. He sells all his fruits in local Kullu mandi (wholesale fruit market of Kullu, the nearest town) and it comes to city markets along with the regular fruits. Good to know people are avoiding chemical means of growing foods not because they want better price for their produce but because they believe in the natural ways of farming. May his tribe increase manifolds. It was our second visit to this home stay and we have already decided to go there twice a year if not more. It is such a recharge for us. This time Lata, Rajiv's wife packed some fresh fruits for us and we have been eating them religiously every single day since we are back. Actually many times a day to say the truth. We love Pear and Rucola salad in many ways, one with mango sauce dressing I have already posted but this time I wanted the salad to be a little more flavourful and added an absolutely divine dressing. Yes the dressing is made using minced pineapple, dry ginger powder, pinch of smoked paprika and real vanilla extract. 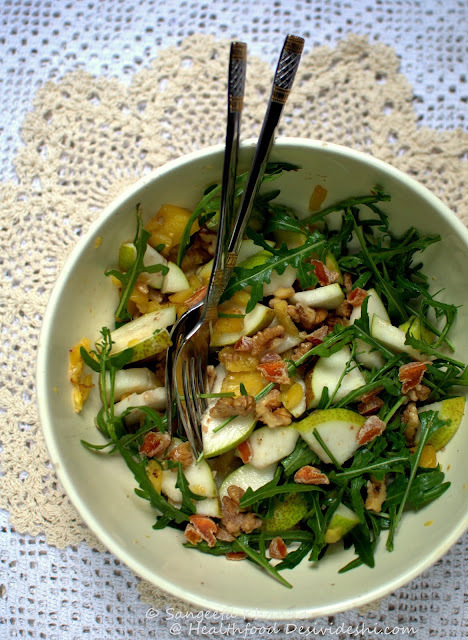 And this dressing blew my mind away, even in this salad which is more on the sweeter side with so much fruit in it. Did you know real vanilla is easily available now? You can order online or buy from specialty stores but please don't use the vanilla essence ever. You wouldn't want chemical flavours into your food and real vanilla is known to be a great antidepressant and mood enhancer. No wonder it is the most commonly used flavours for desserts, everyone naturally feels leaning over to vanilla. Mix the dressing ingredients together and let it rest for about 20 minutes. It can be kept overnight or at least for 24 hours before use. Keep it in an airtight jar if you refrigerate this dressing. Mix the salad ingredients together and pour the dressing, give it a good toss and serve immediately. This salad keeps well for a couple of hours even after mixing so it can be a make ahead salad or a great salad for lunch boxes too. The first time I experimented with this dressing was when I tossed it with apple slices and that was also good. Interestingly that day I made this salad for both of us in a large bowl for our big evening snack but ended up finishing the bowl all by myself. Yes I am totally capable of ding that. Make this salad if you love hints of vanilla in a fruity salad with a hint of paprika heat. It is an interesting mix of flavours and vanilla is not too prominent, though it makes the salad a very happy kind of delicious. 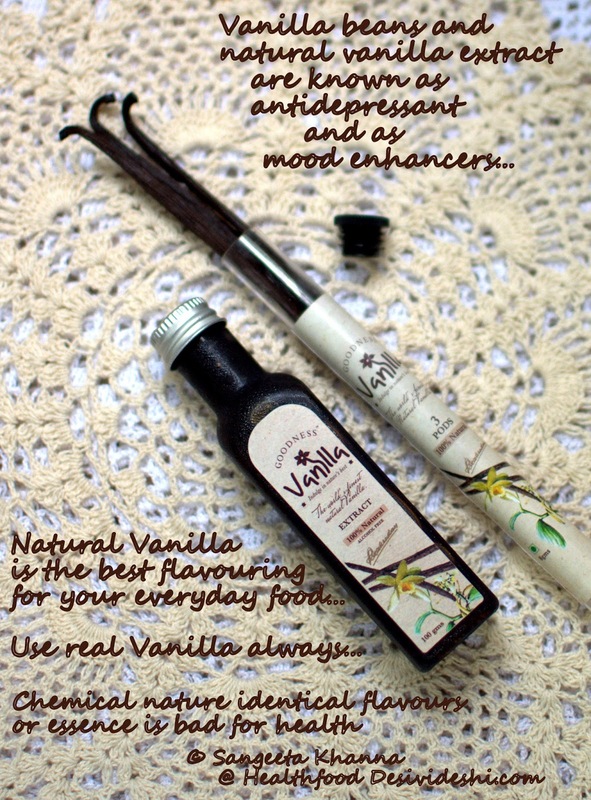 I told you Vanilla is a mood enhancer. Imagine this salad playing it's mood enhancer role during the lunch break in office? 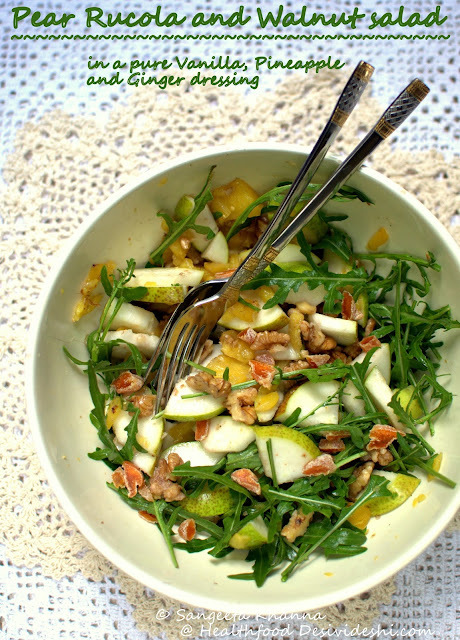 You could use a mix of apples and pears or even just peaches in this salad too. All these fruits behave really well with vanilla. And since we are talking about lunch boxes, please tell me what do you like as a lunch box salads. Do you prefer savoury kind of salads or fruity ones? Do you want to carry salad meals to office or want the salad as a side dish to break the monotony of packed lunch? 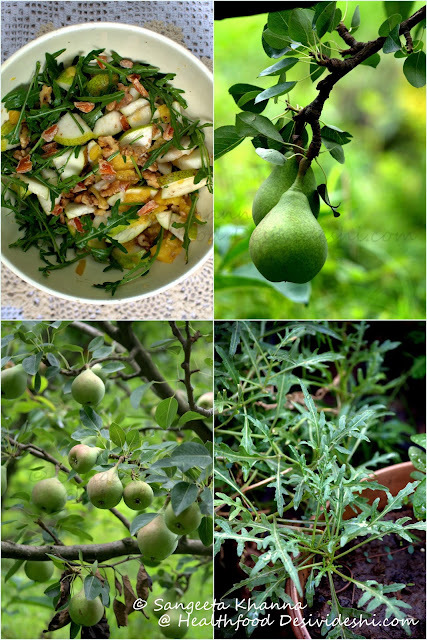 Any favourite ingredients that you like in your salads? Comment here and enter to win something interesting and useful for your office lunch boxes. You can check a few giveaway options I have posted in the lunch box series earlier and wait for a few more announcements. The giveaways will be delivered only on an Indian address unfortunately, so if you are outside India you can provide an Indian address whenever required. Please don;t forget to mention your mail id in the comment section so I can contact you if you win.